that were strange and indeed alien to him"
Like many genres of medieval narrative, pilgrimage serves competing impulses. In the first case, pilgrimage has the ability to make the world strange by placing the pilgrim in conflict and contrast to other peoples. Such narratives use the difference of "the other" to further define the sameness of "the self" against them. In the second case, pilgrimage has the ability to make the self into a stranger by undermining their sense of self and home by throwing them into sympathetic relations with other places and peoples. By encountering and honoring the dignity of the elsewheres, the pilgrimage turns the traveler from a local with an established place in society into a peregrini, a foreigner and stranger, a wanderer with a more dynamic relation to space and society. Indeed, the shift in the worldview of static place to dynamic space, there is a coinciding shift in the view of the self from a static being local into a dynamic becoming foreign. The the prior depends on conservative politics of enforcing divides and withholding resources while the latter emphasizes diversity and sharing gifts. In "Medieval Pilgrimage: an Outline" from her book, Medieval European Pilgrimage, Dianna Webb traces these competing impulses which brought about pilgrimage as a medieval structure of narrative and biocartographic ritual. From this outline of the genre and ritual, the hermaphrodite arises as embodiments of gendered social constructions of place and people as well as critical figures that shaped pilgrimage as a real and imagined engagement with the world. The history of pilgrimage in Christian traditions evidences how the practice arouse in response to the universalizing of the Church and the centralizing of places as fixed in the cultural mappa mundi. "Christian pilgrimage, at least over long distances, was probably relatively uncommon before the reign of Constantine," writes Webb (2). "Christians were true peregrini in the original sense of the Latin word, 'strangers' or foreigners' in the midst of sometimes hostile society" (2). As Christians no longer felt like foreigners in their world, they felt called to go on pilgrimages that would unmore them from their sense of place and transform them back into peregrini. Such dislocation from the sense of being at home would prompt a return to being pilgrims amidst social unsettledness, as well as Webb writes, "spiritual pilgrims between earth and heaven, between physical birth into this world and spiritual rebirth into eternal life" (2). In the uncertain and persecuted beginnings of the Christian church, there was less need for rituals of travel or fantasies of narrative to create a sense of contingency and liminality. Many places, even the wider world, was not a secure home for Christians. It is only after Constantine and later when Christianity rise from subjugated to subjugator among the world and its people that pilgrimage was in demand as a way of becoming- or rebecoming-foreigner. As a social practice of biocartography, the work of pilgrimage narratives and travels was to assert within God's omnicience and created world a distinction between places, marginal and central, which could be used to subordinate peoples and locations under particular authorities. Webb argues that the idea of loca sancta, sacred locations, were not always considered traditional nor orthodox in the Christian worldview. Webb writes, "[t]he concept of 'holy places,' of sanctified earthly locations of peculiar Christian significance, was in important ways at variance with beliefs in which Christians had been schooled fro the first days of the Church." (2) Yet the movement towards the carving up of a unified shared world into distinct and hierachalized places has evident benefits for the centralizing of power around the Church as a physical and spiritual structure. The "first step" towards a Christian conception of place over space, write Webb, "was taken almost as soon as the ecclesia, the assembly of the Christian people, moved out of private houses and clandestine meeting-places into purpose built churches, and the buildings themselves became the ecclesiae" (2). In other words, the physical construction of Churches began the project of organizing space and orienting populations towards centers of Christian authority. From churches arouse shrines which expanded the work of churches to new areas while also clustering around certain topographies such as Rome and Jersualem to cement their centrality in the imagined mappa mundi. As a result pilgrimage began to serve two competing but not mutually exclusive purposes: (1) social biocartographic structuring of power across networks of places and peoples, friend and foreigner; and (2) personal experience of crossing boundaries of place and people in order to become-foreigner. The twofold work of pilgrimage at once made intersex and trans bodies into foreigners from foreign lands as well as invited travelers to become hermaphroditic foreigners themselves. As will be shown, the holy sites of hermaphrodites were one of many Greco-Roman traditions adopted (if marginalized) within Christian mappa mundi. "The number of holy wells which became and remained associated with Christian saints speaks for itself," writes Webb (4). Beyond those places named for Hermaphroditus, for instance, the features of trans and intersex loca sancta were adapted for Christianity in ways that erased their classical associations. The well of Hermaphroditus that could transform a person's gender exists within a tradition Christianity wholly embraced: waters of baptism where the spirit was changed or waters of healing where the body was changed. Thus even as histories were forgotten, the locations and rituals remained. Change and travel remained linked ritually and narratively from the classical to medieval era. To understand how this works, a brief understanding of the orientating work of loca sancta as destinations and the disorienting work of pilgrimage in drawing people across borders. Because of the allure for strange and wondrous pilgrimage narratives, encounter with trans and intersex bodies were a natural conclusion for the genre. "Most of the more interesting accounts emerged from the Holy Land pilgrimage," writes Webb, "because the journey was bound to introduce the Christian to people, places, and things that were strange and indeed alien to him. Relatively few narratives are totally devoid of reaction to these stimuli" (175). Once the center of the world became domesticated by familiar routes, maps, and narratives, however, the desire for the foreign became fulfilled along the margins. Hermaphrodites on the Hereford Mappa Mundi or the Isle of Amazons in the Book of John Mandeville then are not extraneous to the genre of pilgrimage but the fulfillment of the project of making the world strange. Among medieval genres, pilgrimage is concerned with the narration of place, dissecting space to establish one location as home and another location as foreign then turning the space between them into a road across which travel and narrative can flow. The narration of place is critical to the genre of pilgrimage which functions according to a linear movement (cyclical if the journey is returned) from one point to another. The environment between these locations are then developed in order to serve as the challenges and changes in the plot. Yet these locations (home, road, and destination) are not all equal. For most of Christian pilgrimage narratives, the reason for the tale is teleological. The destination is the moving, attracting, and orienting force of the narrative. Both home and the road become subservient or marginalized in the tale. The movement of pilgrimage towards a loca sancta is the function of setting places as set aside from one another. Places function as calls for narrative just as narratives organize the social space. Introducing the Blessings of Pilgrimage, Robert Ousterhout defines "loca sancta" as the "special places" behind holy travel, "where the powers of heaven were more easily tapped, either for earthly benefit or for aid in salvation" (Ousterhout 1). In her essay, "Loca Sancta," Sabine MacCormack develops the concept further. "Certain places, objects, or persons were regarded as sacred or venerable for some reason, and the faithful undertook to visit them for devotional purposes" (MacCormack 7). What is evident in the lived tradition and transmission of belief in loca sancta is the critical role of narrative. As a result of hearing or reading these stories, people became filled with the desire to go there. God could appear anywhere and in anything but when God does appear it is always in particular places and particular things. Ironically, this call to pilgrimage arising out of loca sancta depend both on the specificity of a unique encounter and the belief that by taking the place of the sacred figures in the sacred place that the encounter could be somehow repeated. The power of place is at once particular and transferable. The place are hailed as natural or divine wonders but show the construction and commerce that determine what is attractive and what is estranged. Foreignness in medieval pilgrimage is not a natural given (what happens to be far away) but is an effect of cultural constructs that structure what places offer an attractive affinity and what locations are merely marginal or even repulsive. Much like the physical architecture that maintained loca sancta from forces of entropy, the repetition of narratives about places and paths reinforced their significance. Genre narratives made locations readable just as locations defined the genre by their physical and social particularities. "Pilgrims may be classified, then, by where they went, and by their reason for going" (xiii). In this context, collections of tales such as the Book of John Mandeville has evident story lines wherein not one but two pilgrimages are made. The second which occurs in the latter half seems to break from many normative conventions but in many respects extends and turns many of the moves in the first half of the book. Eccentricities granted, in this first half readers are given a fairly recognizable pilgrimage narrative. 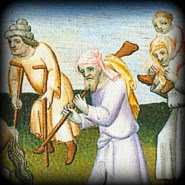 Mandeville travels from a place on the margins (England) to a center of Christian life (Jerusalem). Along the way he undergoes trials and encounters that alter him in preparation for arrival at the holy land. Medieval theologians such as Augustine in his City of God note that even as they tore down and discredited many sacred pagan shrines and groves, Christians would rebuild their own holy structures and narratives around those loca sancta. The "Old" holds in in the spirit of the "New" but needs the work of new buildings and narratives to make the hidden essence of the loca sancta as ancient texts readable to new visitors (Augustine, City of God IV.33). Medieval authorities did not leave pilgrims to read a place "like they would read a book," MacCormack writes, "Christians had taken practical steps to hieghten and make clear such meanings" (25). 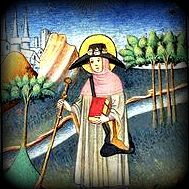 In a very real sense, Augustine predicts both in his critique of the Old and his envisioning of the New encounters and stories awaiting their narrator the cyclical yet centrifugal movement of pilgrimage that draws circles of travels around loca sancta but which grows with each subsequent journey like New Works built on ancient buildings or tales in a growing saga. The function of sacredness and foreignness is not only in the environment but a product of the repeated cultural movements that follow, change, or cross these boundary lines. Settings require story to bring them to life and transmit their power across distance and generations of pilgrims. Places and pilgrimage gain and sustain their meaning through the telling and retelling of narratives. "If in Christian eyes holiness was not inherent in a place, it could nonetheless be achieved by Christian ritual and by regular worship," writes MacCormack. "Place might be viewed as indifferent but human action could never be" (17). Places may or may not make active calls of their accord but with narrators to hear and give them speech, the stories became how places came into being as distinct and sacred loci. The location needs the story to make it speak to travelers and the story needs to environment to ground it. Yet in this depdency, there is a suggestion that lands, like people, might take on other roles, identities, and shapes if only society changes the stories they tell. Locations can arise as holy as the result of a story. Coleman and Eade writes that they prefer the term "sacrilize" rather than "sacred," "to emphasize the often partial, performative, contested character of appropriating something or something as holy" (18). Narratives constructed meaning for places that places proved the veracity of narratives, including scripture and saints lives. Movements and places were metaphorical as they were real. "Such a capacity for 'doublethink' may be a characteristic of thought patterns in the Middle Ages," writes MacCormack, "the symbol and the prototype were regarded as equal, or at least a part of the same reality" (7). There was not a fundamental different between reading about a pilgrimage and physically going on one. There is a qualitative difference but much of medieval Christianity functioned by way of intermediaries. Reading a story or being touched by a person or object that in turn touched something holy was the best that many people in the Middle Ages could expect. For those confined at home by poverty, disability, gender, or other circumstance, reading pilgrimage narratives could be a way to undergo the travel through a proxy. There is a cyclical repetition in travels as bodies and narratives revolve around specific loca sancta, affirming their meaning and centrality while spinning other places and peoples off into the margins. The difference and tension between what and who are central and what and who are foreign are important enough to be contested. The control over loca sancta gave Christian authorities more power over those who traveled to and through the sacred place (MacCormack 18). By encouraging the flow of people and resources from the margins of the world towards these centers of culture, authorities gained a kind of wider dominion over the margins. While the list of loca sancta may be numerous, certain places and authorities who controlled the wider narratives of pilgrimage gained influence over the others. 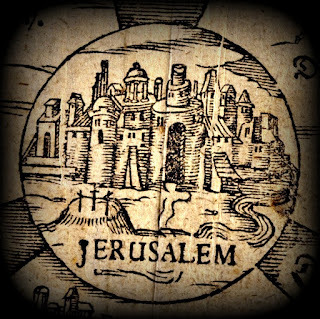 Among these locations, Rome and Jerusalem were among the few places that controlled the many. "Space as perceived by Christians was thus no longer neutral," writes MacCormack, "in Rome and elsewhere, space was ordered in a system of focal points of sacred power" (19). 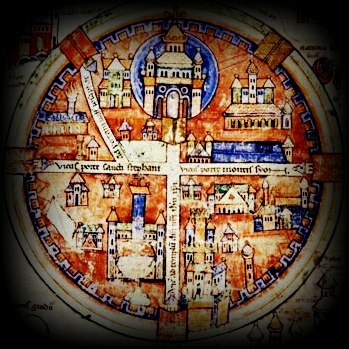 In the medieval conception of the world as imagined in T in O mappa mundi, the world could be considered like a circle with Rome and Jerusalem in the center and the rest of the world on the margins. The marginal places remain worthy of marking but are oriented towards the center that structures their meaning. In effect, the center becomes more central by the marginalization of other locations. This centrality was affirmed through the unfolding of pilgrimage journeys and stories. Walking on pilgrimage and writing a pilgrimage narrative were deeply entwined. A pilgrim was aware of following a script based on other travels and stories. Likewise, they would likely share their journey with those at home or those who would follow. In many respects, pilgrimage was a discourse that fed into a biopolitical loop where social narratives causes movement which in turn causes a social narrative which causes more movement. One had a sense on the road that one is participating in a story that had been told again and again. New pilgrims enter into the tale and carry on the journey in the place of old pilgrims, like the rhythm of walking where foot replaces foot, or how the arrival of new destinations replace the margin from which one departed. While the structure of pilgrimage genres creates distinctions and hierarchies between places and peoples, the movement of pilgrims through the story of the road crosses social and physical boundaries that lead toward a wider sense of shared foreignness and space. Indeed, the encounters with other locations and peoples, including the big Other of God, causes a breakdown in bordered off world views. Even as loca sancta worked to structure discourses of place and people around religious ordering, there continued to be critiques that the experience of God in time and space could never be contained or hierarchized into set parameters. "What temple can I build for God seeing that the whole universe, which is his creation, cannot hold him?" writes Minucius Felix in his Octavius (13). One of the defenses that arose was that loca sancta point outward rather than inward for their significance. "In a holy place," writes MacCormack, "spatial and temporal duration were suspended," making a holy place a kind of mini cosmos in itself. By creating a sense of the wider world and history within a circumscribed locus, mappa mundi and pilgrimage texts like John Mandeville's are mini reproductions of the critical work of loca sancta. Yet these suspensions are not the same as annihilation. Space and time continue to flow outward calling readers and travelers to challenge the limits of the world imagined by such compact narratives and locations. One begins to ask upon encountering that which claims to contain all times and places the question: what elsewheres and elsewhens are left out? "Standards were laid down at the highest levels by which sanctity and miracles were to be authenticated, but pilgrimage was never confined to saints and cults that had received the seal of official approval," writes Webb (xv). While seeming to break down the rules by which the genre is defined, the act of crossing and changing boundaries was in integral element of pilgrimage. As creative work, the constructing, deconstructing, and reconstructing of walls was the effect of the ongoing tensions of the genre. While set apart as places of particular significance, loca sancta gained meaning by networking together through narrative and relative distances. In the authorizing of "Christian sacred space," MacCormack argues that Church authorities "were bringing into existence a network of holy places" (18). Certain locations like Rome and Jerusalem may be able to edge out competitors, yet the popularity of pilgrimage was encouraged by have a wider diversity and number of sacred sites. Not every illness would warrant or allow far travel. Likewise, a journey to Rome may encourage further travels out of a desire to cross new ground. As Rome became domesticated, it lost the allure of being foreign. Even to sustain the attractiveness they held, loca sancta needed to invoke elsewheres in contrast. When one arrives at a center of Christianity, what is evident in the crowds is how many other places and peoples there are in the world. While all roads lead to Rome, when in Rome all roads lead elsewhere. Rather than containing meaning and power in specific places, pilgrimage functioned to share sanctification between loca sancta and even the margins which their centrality eschewed. The attraction of loca sancta for those on the margins is that they might share in the sacredness of another place and that the effects of its grace would travel with them back home. Loca sancta turned from close circuits into nodes in a wider network of power. "A complete map of medieval pilgrimage, were such a thing conceivable, would have to consist of a number of maps, on very different scales, superimposed on one another or visualized simultaneously" (Webb xii). Pilgrimage as a physical journey and as a narrative is sets up networks of power that runs through those who connect the centers with the margins. Each place, even those on the margins, for those who live or travel there becomes a kind of center. As a result, the enactment of pilgrimage as a ritual and narrative creates many maps with many centers. These locations compete for power yet share a common need to encourage the constant flow of matter and meaning, people and power across the many divisions of space. Not everyone however was equally able to engage in a sense of space. Because of conflicts between the physical and social environment on particular bodies (women, people with disabilities), the road was not as open to them as others (able bodied Christian men). The ability to be a pilgrim, to sacrilize a location, is not socially and even physically allowed for all bodies. Coleman and Eade writes. "pilgrimage can be seen as involving the institutionalization (or even demostication) of mobility" (17). Who is allowed to travel becomes just as critical as how the travel occurs and what costs and changes it enacts on those who go on pilgrimage. As a result certain bodies became synomous with certain places because they lacked the physical and/or social mobility to leave. Amazons and Hermaphrodites become associated with their Isles, while Mandeville is free to travel between them. Likewise, the experience of world and space was a privelege in contrast with those whose world was only as far as the next town. "Different groups disposed of different resources and also different degrees of freedom, both of which affected the capacity to make long journeys. Female participation in pilgrimage was, of course, conditioned by all these variables. All the indiciations are that men considerably outnumbered women as long-distance pilgrims, but there picture at many local shrines was very different" (Webb xiii). In other words, ablebodied cisgender men could afford to become foreign, become perergrini while other bodies could only experience this through narratives brought back. Thus while Mandeville looks on trans and intersex bodies within his book, can we imagine trans and intersex people looking back at his body or indeed reading his book? Might he and his travels be as much of a marvel to them as they were to him? Often pilgrims would collect and transmit badges, souvenirs, or else stories and their own bodies as evidence of contacting the divine presences in these loca sancta. The narrators came to embody this power by their ability to claim and narrate their contact with loca sancta, making their body and texts transmitters of grace or secondary relics (21). Reading a text or speaking with someone who walked the places where Christ walked may not be as powerful as going there in person, yet these pilgrimage objects carried with them special significance as intermediaries. Physicists claim that every action has an equal and opposite reaction. Each step forward creates a force backwards. Perhaps in a cultural form of this law there ever seems to be an undertow that works against the centralizing of the authority in a few locations. The margins and the marginalized begin to realize that they have a lot more power than they have been made to believe. The drive to divide the world into loca sancta and non-loca sancta, centers and margins, departures and destinations is not always imposed on the people by authorities but adopted willingly. Webb writes that people want to imagine loca sancta out of a desire for a better world, "[t]he apparently deep-seated human tendency to locate the holy at a distance from one's everyday surroundings and to seek solutions to personal problems and the alleviation of suffering (or boredom) in a journey to such a place" (viii). One wants to believe that there is a loca sancta somewhere else like one believes the grass is always greener on the other side of a wall. What such an explanations allows, however, is the possibility that loca sancta might begin to feel too domesticated by those who live there. As a result, as time and repetition goes on, pilgrimage to the usual few centers of authority may no longer excite. In this malaise, the possibility of anti-loca sancta begins to rise. In the later years of a pilgrimage cultures, the wonders of the margins may begin to rise and draw power, travelers, and narratives away from the centers. 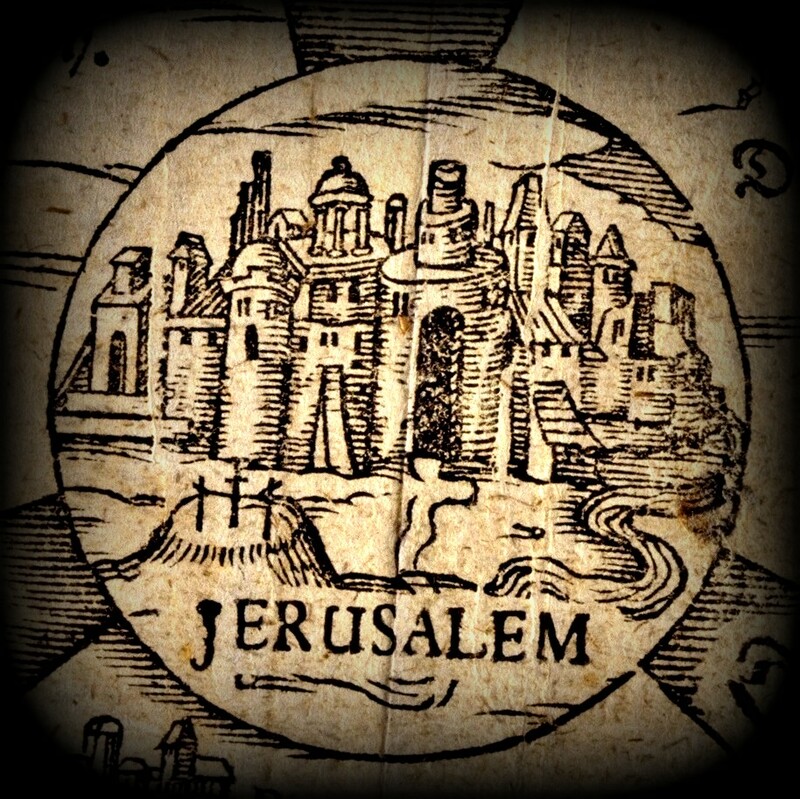 After Mandeville successfully walks from one edge of the world to its center in Jerusalem, he feels the call to continue his pilgrimage and his story back into the margins. And many readers are glad he did. For the second pilgrimage is in many ways more interesting than the first and fulfills the promise he made in the start of his book and repeats again as the thesis for his second journey, "now wole Y telle of yles and dyverse peple" (Mandeville). By opening up his narrative and inverting the power structure of place, Mandeville and his Book become more and stranger than they were. Mandeville encounters foreign places and peoples, like the Amazons and Hermaphrodites, only to return home with a body and text that reflects the hard work of becoming foreign.